The National Inquirer published a front page article on March 25, claiming that Senator Ted Cruz has had affairs with 5 women. Unsurprisingly, social media immediately started to enjoy itself, with thousands of posts hashtagged #CruzSexScandal. Embarrassing and insulting picture, graphics, memes and “insights” flooded the Internet. It was easy to find, trending on Twitter. … public figures are people, too. They ought to have some space, some privacy, some peace. Yes, they beg for our attention and yes, they spend much of their time hogging the limelight. But they – and their loved ones – are at root just as human, fragile, needy and imperfect as you are (maybe more so) and they do NOT deserve to have their lives invaded, incessantly. However one may feel towards Mr. Cruz and his professed politics, he and his wife and family do not deserve glaring exposure of their most intimate lives. If he has had relationships outside of his marriage, that may be no secret to his spouse, it may be their “deal” or it may not. The frequency and range of his fornication really is not relevant to his fitness (or in Cruz’ case, manifest unfitness) to hold the highest office in the land. It wasn’t relevant when we thought only one woman slept with him, or now that we think six did. Or do. Or whatever. There was a time when I would have agreed. In fact, for most public figures, I still do. However, there is a class of public figures which I believe, by their statements and actions, give consent to a deep and ongoing scrutiny. David starts to make the point himself but stops before its completion. The counter argument to that position is that Mr. Cruz, having made such a big deal about his Christian faith and non New York values, has actually placed his personal life in the spotlight and therefore surrendered his right to privacy. This argument has some traction, if fidelity to a particular version of Christian observance has been a central tenet of his “pitch” to the electorate. The basic thrust of this, of course, is that Mr. Cruz might be a hypocrite. It is not that Cruz might be a hypocrite. If we outed every hypocritical politician, we would not be able to fill the Commons bathroom, let alone the Commons itself. Hypocrisy is an essential part of democracy, as politicians must often turn from their own beliefs or best instincts to represent the desires of their constituents. 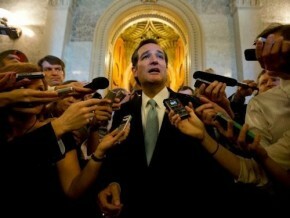 But Cruz is a member of a different population of politicians. He proposes, in no uncertain terms, a religious template to be applied to his country. That this template is fundamentalist Christian is not important. It is little different than other Christian sects, Sharia law or rabbinical fiat. It is the deeper intrusion to the life of a citizen by leadership not constrained by law but by interpretive belief in a religious text. Cruz is yet another example of a supposedly deeply religious person trying to apply his morality in governing a country. While every such campaigner has been found to have feet of clay, this type of campaign has created a religious test for politicians. David, I agree with you in most cases. But politicians like Cruz and his ilk must continually be researched and monitored, lest their insidious campaigns succeed. But you don’t understand. As long as he repents and his wife stands by him all is well.